Every day, Boston University’s campuses are traversed by a myriad of pedestrians, bikers, MBTA Green Line commuters and motor vehicles. For students who live and go to class on opposite ends of campus, transportation is critical to bridging the gap. There exists one mode of transportation created to simplify the commute across BU’s campuses and at no cost to the BU community: the BU Shuttle. Thousands of commuters use the shuttle to travel to classes, clubs and back home again each day. Introduced at the beginning of the 2004-05 academic year, the shuttle is primarily designed to serve as the most efficient method of transportation between the Charles River, Medical and Fenway campuses, BU spokesperson Colin Riley said. When the shuttle began service in 2004, two buses circulated one route with four stops: Silber Way, Huntington Avenue, BU Medical Center and Danielsen Hall, Riley said. The bus operated on weekdays from 7:30 a.m. to 10:30 p.m., and buses arrived at each stop every 30 minutes. Today, a fleet of 11 buses operates along four routes, Riley said. 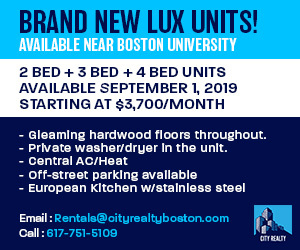 There are 13 stops between the Charles River and Medical campuses, seven along the Commonwealth Avenue loop, five on the Fenway route and 11 on the late-night route. According to Riley, the bus now operates with 10–30 minute headway from 7 a.m. to 2 a.m. Monday through Wednesday, 7 a.m. to 4 a.m. Thursday through Saturday, and 7 a.m. to 2 p.m. on Sundays. This year, the university expects to serve more than two million rides on the BU Shuttle, Riley said. Each bus was fully refurbished two years ago, he noted, and the height of each bus can be adjusted to accommodate commuters with limited mobility. Riley noted that with such heavy anticipated use, the university is monitoring the shuttle system and working to make sure it does its designated job. Many commuters, such as postgraduate School of Law student Emily Center, rely on the shuttle every day to get around campus. Zach Lam, a junior in the College of Engineering, said he’s usually not in a rush to get to his classes but does rely on the shuttle when commuting to West Campus. Not every student who has taken the shuttle across BU’s multiple campuses has had a good experience, especially when relying on it to get to class on time. Last semester, College of Fine Arts sophomore Liz Klayman would travel from her Fenway Campus residence to a morning class a mile away in CFA. Klayman said she would get on the shuttle headed outbound toward StuVi II but would frequently wait upward of 20 minutes before the bus would begin to move. Klayman said she had bonded with one of her classmates, who also lives in Fenway, over their shared experience of being late to class because of the shuttle. Center, who lives between the Medical and Charles River campuses and uses the Huntington Avenue stop, said the bus can take a considerable amount of time to get moving going outbound from the furthest parts of BU’s campus. Riley said the shuttle’s schedule can be disrupted by the inevitable effects of living in a city. “When you’re in an urban area with the weather and traffic and construction, [drivers] work very hard to maintain their schedules, but it’s not always possible, of course,” Riley said. 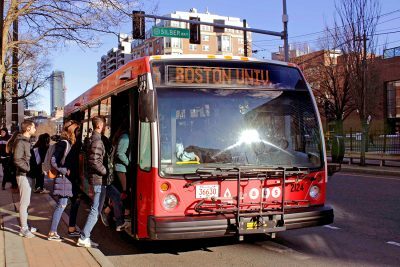 Students, such as Lam, have expressed frustration over the BU Mobile app, which allows users to access the bus schedule and view estimated arrival times for each stop. The app, which is only available for iPhones and not on Android, also has a live GPS view of where each bus is at a given time. The GPS tracking system, which was released in February 2010, is something BU Parking and Transportation Services is working to make more efficient, Riley said. Commuters can also access the live view on the shuttle’s website. Announcements regarding delays, maintenance issues and other updates are sent out regularly on the shuttle system’s Twitter, @BUShuttle, which has about 2,800 followers. Rubén Cerón Guevara, a Colombian architect and program manager at North Shore Community Development Coalition, has designed bus transportation systems in Colombian cities, including Medellín, Bogotá and Cali. He said he sees the BU shuttle as a promising component of Boston’s transportation network, which ultimately makes commuting more multimodal. “If you look at the structure of the BU shuttle network, it’s pretty interesting how much they overlap with the MBTA and how much we are affecting transportation in a very short segment of a main road, such as Commonwealth Avenue,” said Cerón Guevara, who also works in the Metropolitan College. Transportation that makes up for the inefficiencies of other existing methods is something that defines a well-circulating urban space, Cerón Guevara said. He noted from his own experience the BU shuttle gets him to time-sensitive destinations with fewer stops and in a shorter time than the Green Line does. Sebastian Porreca, a freshman in the College of Arts and Sciences, said the shuttle is valuable to the community despite being undependable. Porreca said he doesn’t usually rely on the bus and likes to make time to walk where he needs to go. According to Riley, the shuttle was designed for students to travel between campuses or make a long trip down BU’s two-mile Commonwealth Avenue strip. He said he wants students to understand its original purpose wasn’t to make short trips that could be done by foot.